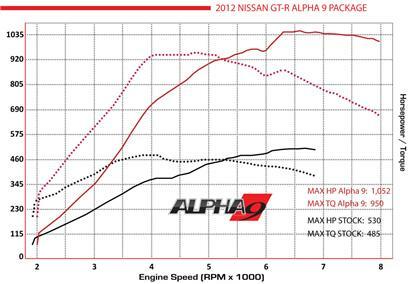 The Alpha 9 package for your Nissan GT-R offers the most reliable bolt-on horsepower available and we have proven results to back it up. This package offers stock-like turbo spool up and drivability while boosting power output to an astounding 1050+ horsepower on race gas and 950+ horsepower on pump gas (with optional forged engine and transmission). The Alpha 9 package has more accolades than any other package available and even holds the stock manifold turbo upgrade record in the quarter mile! When you lean into the throttle of the Alpha 9, a smooth burst of speed plants you firmly in your seat and pulls strong throughout the entire rev-range. No added turbo lag and no drama, just pure exhilaration unlike anything you have felt before. So quick, it out-accelerates the $1.5 million, 1000hp Bugatti Veyron all the way to 130+ mph on regular 93 octane pump gas! Motortrend magazine said the Alpha 9 GT-R was the quickest car they have ever tested! Our Alpha 9 test car has been through more abuse than you can believe and the stock engine is still running strong. The car has been tested by Edmunds.com, Motortrend and Modified Magazine with rave reviews. From countless acceleration blasts performed by Edmunds.com to full mile flat-out runs made by Motortrend in 100+ degree heat the Alpha 9 test vehicle continues to run strong and impress the experts. After the round of Magazine testing the same Alpha 9 test car performed flawlessly on a cross country road test with the owners of the popular GT-R forum board www.nagtroc.org. After all of that testing, we bolted on a set of drag radial and blasted off the world’s first 9 second quarter mile run on pump gas with a 9.95 @ 141 mph! Short bursts of acceleration are fun but what better way to prove reliability than running flat-out over a full mile? 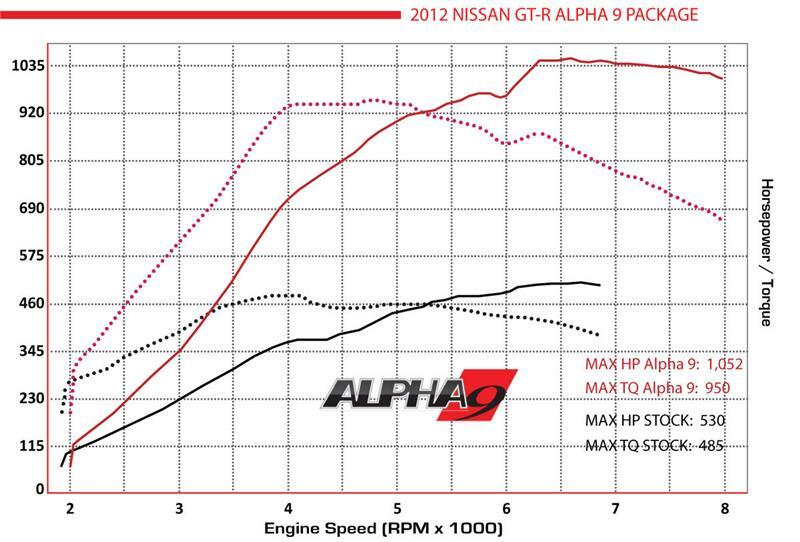 In a standing mile an Alpha 9 GT-R ran a blistering 205.3 mph! The Alpha 9 package continues to post more impressive times at the track as traction and engine management systems have improved over time. On August 29, 2013 Alpha dealer AWD Motorsports set a new record for a stock manifold turbo system in his Alpha 9 recording a blistering 9.02 @ 153mph! At the heart of the Alpha 9 package are custom AMS billet wheel ball-bearing turbochargers. These units provide enormous gains in horsepower and torque throughout the entire rev-range WITHOUT added turbo lag! It’s a win/win situation that is unheard of in the industry provided by the latest in turbo technology. These are the same race-proven turbo’s used by professional race organizations such as the Forged Performance Time Attack Team and Brass Monkey Racing Team World Challenge GT-R’s so you can expect the best results. On racing fuel the Alpha 9 belts out over 420 additional horsepower than a stock GT-R. . . placing the Alpha 9 package in a league of its own. The best attribute of the Alpha 9 package is unmatched drivability with mind-boggling speed. Through rigorous research, development and testing, we have achieved a package with perfect drivability yet is quicker than any supercar you can buy. While the Alpha 9 on the stock motor is a force to be reckoned with making 800hp on pump gas there is even more on the table. By adding one of our forged motors and transmissions the Alpha 9 power potential is increased to 950+ hp on pump gas and 1050+ on race gas! Now you have even more power at your disposal and enough to embarrass even the most exotic of supercars.